Hosting an event at the Medical Center or River Campus? To make a reservation, please begin by completing the special event reservation form. Please indicate in your reservation if you would like to include any of these services during your event. 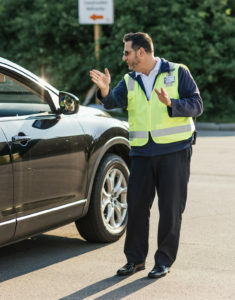 Parking attendants are available for mobile patrol, directing traffic, and staffing at gated lots and/or the Information Booth. There is a two-hour minimum for attendant services. Attendants will begin 30 minutes before the event start time. The following options are available to help direct and manage parking for your guests. Please specify the location(s) where the equipment is needed and when they should be set up and removed. Cancellations: Please contact our Special Events Manager at mgayton-tanksley@parking.rochester.edu at least 48 hours in advance to cancel your event reservation—if not received by this time, you will be responsible for 50% of the event fee. If event is cancelled on site, you will be responsible for the full event fee.